The play opens with a monologue that is a TED Talk, the global conference brand that began in 1984 (a convergence of Technology, Entertainment and Design) to “spread big ideas.” It’s delivered with wit by Danny (Polly Draper), a photographer, in her presentation. 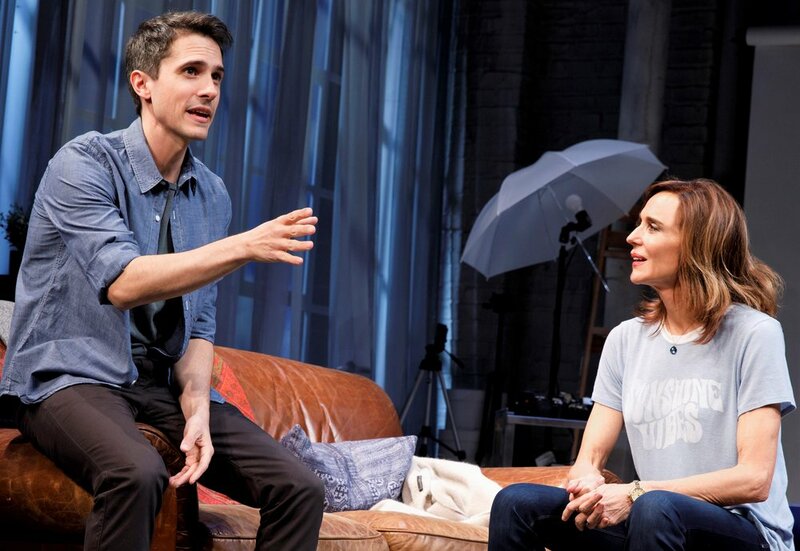 In the context of Miller’s play, this setting symbolizes the enormous potential the 20th century represents, and, in conjunction with Danny’s relaxed, headphoned, sweater-jeans-and-sneakered stance, it establishes a familiarity that runs throughout. Danny’s “once upon a time” TED Talk tells how she failed, then dropped history at her university, swapped it for fine art (“no words necessary”), became a photographer of note, and met the women who became her lifelong friends and the subject of the work she has chosen for an exhibition at New York City’s Museum of Modern Art (MOMA), which has offered her a retrospective. And then the play proper starts. 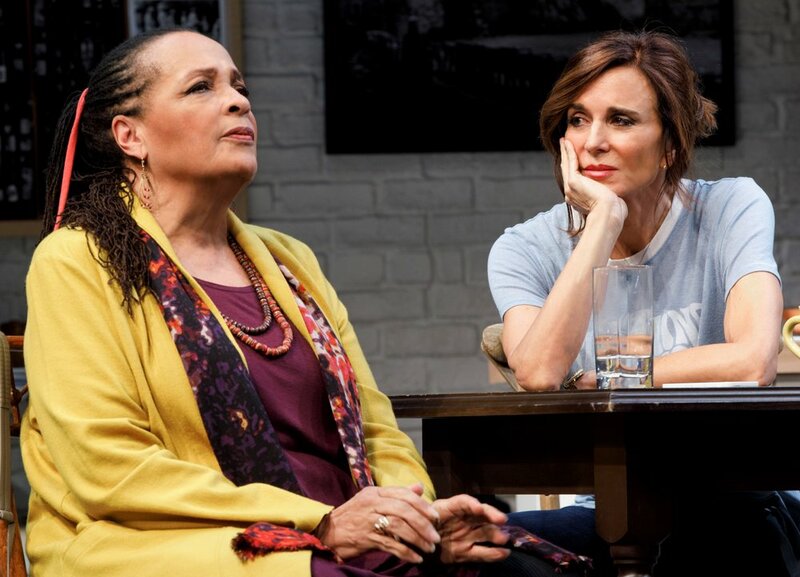 Franchelle Stewart Dorn (left) is Mac and Polly Draper is Danny in Susan Miller’s 20th Century Blues. Top (left to right): Draper, Kathryn Grody as Gabby, Dorn, and Ellen Parker as Sil. One by one, three women arrive in Danny’s high-ceilinged, light-filled loft—presenting themselves for brunch and the final photo in a series of annual portraits Danny has been taking for 40 years. Soft-spoken, gentle-mannered, warm and cuddly, Gabby (Kathryn Grody) is a Chicago-based veterinarian, married and with health problems; Mac (Franchelle Stewart Dorn) is a no-nonsense lesbian, a steady-drinking reporter of news and current affairs; and Sil (Ellen Parker) is a sassy, financially challenged divorcée, a real estate broker with low self-esteem. The play’s real conflict arises when Danny asks for signatures on release forms required by MOMA—affirming the women’s consent to exhibit their images. The pros and cons of going public tear at the fabric of their friendship. The final photo and the entire exhibition hang in the balance. The images of these are at the heart of this story. Forty years is a lot of time, and the images would clearly show how these women have changed. Metaphorically, it is also very powerful—the 20th century was a time of upheaval for women. The images would reflect not only how time has affected them but the impact they have had on the times. The mood of the piece is easy if somewhat loaded; the conversations are clipped and swift, touching on but not touching down on anything too deeply or for too long: from gender and sexuality to sexuality and money to politics and beauty—face-lifts in particular. There are other sides to Danny, too: devoted daughter to Bess (Beth Dixon), an aged artist in her own right who is in the early stages of dementia, and mother to adopted son Simon (Charles Socarides). Draper as Danny with Charles Socarides as Simon, her adopted son, in 20th Century Blues. Photographs by Joan Marcus. Theatrically, that is a lot of pressure on the final reveal of these images in director Emily Mann’s production. In addition, because the character of Danny has built up a reputation and gained notoriety for her creativity and socio-ethnographic insights, there is further pressure when the audience finally sees these photos—much-talked about, and upon which this story hinges. Perhaps because everyone and their dog have been empowered photographically by smartphone devices with extraordinary photo capability, the expectation is of excellence, but it’s no surprise when Danny’s photographs don’t live up to such pressure. The production is let down by less than superlative images. The familiarity extends to scenic and projection designer Beowulf Boritt’s work. The set, for instance, underlines Gabby’s description of Danny’s apartment—“What is it about this place? It’s like I can see your synapses. And your beating heart.” Darron L. West’s uplifting, interlude music (he also designed the sound) contributes to the collaborative ease and pace with which this production flows. As the play progresses, tension builds, and the heat in the kitchen is not just under the French toast that Danny serves her guests. There’s nothing like the slick, upbeat flow of the familiar to create a distinct feeling of discomfort. But although the fast-paced rhythm might be intentional, it is distracting. A pace modulated for moments of more complexity might have lessened discomfort and created a deeper focus. That said, 20th Century Blues is a slick, smart script that’s being given an enjoyable ensemble production in pursuit of the power of friendship. 20th Century Blues runs through Jan. 28, 2018, at The Pershing Square Signature Center (480 West 42nd St.). Evening performances are at 7.30 p.m. Tuesday through Friday and at 8 p.m. Saturday; matinees are at 2 p.m. Saturday and Sunday. For tickets and information, visit the theater box office or call Ticket Central (212) 279-4200); or online, visit www.ticketcentral.com.